Talking to South Punjab News, Jarnail Singh from Canada said Pakistan, India, Bangladesh, and Iran should introduce free trade among their nations which would help overcome poverty, violence, and extremism. 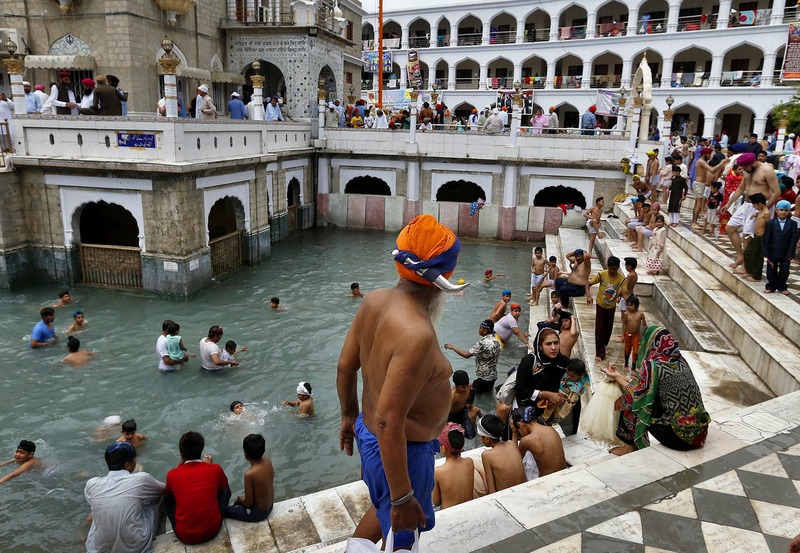 A Sikh pilgrim leaves after taking a holy bath during the Vasakhi festival, at the shrine of Gurdwara Punja Sahib. 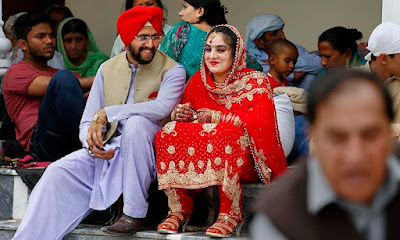 Despite tension between India and Pakistan, around 2,200 Sikh pilgrims from India arrived at Gurdwara Punja Sahib Hassanabdal on Saturday through special trains to offer their religious rituals in connection with Baisakhi. The Hindu and Sikh devotees also came from Sindh and tribal districts. Sikh and Hindu devotees wearing colorful dresses and turbans were seen offering their religious rituals amidst light rain and pleasant weather. Gurdwara was echoed with the Sikh religious slogans of Wahe guru Ji Ka Khalsa, Wahe guru Ji Ki Fateh and Jo bolay so nihal when Sikh pilgrims have started offering their religious rituals on Saturday, the first day of the Baisakhi festival. Talking to newsmen at Gurdwara Punja Sahib Hassanabdal Deputy Secretary Shrines Evacuee Trust Property Board (ETPB) Imran Gondal said Pakistan was home to a number of sites that held importance in Sikhism. Various groups leaders while talking to Dawn said that their spiritual and religious attachment with the Pakistan was above the diplomatic and political issues and despite all tension, they would continue their pilgrimage as per their religious calendar to Pakistan. Ravinder Singh Khalsa of largest Indian Sikhs representative body known as Shiromani Gurdwara Parbandhak Committee (SGPC) asserted that Sikhs from India did not feel frightened at all after coming to Pakistan to offer their religious rituals. “We feel like we have come to our second home,” he added. Ravinder Singh said he would also hold a meeting with the newly constituted 10-member committee of Pakistan Sikh Gurdwara Parbandhak Committee for chalking out programmes for the 550th birth anniversary of Guru Nanak Dev as well as on Kartarpur corridor. Mr Singh thanked Pakistani government and ETPB for extending better facilities to Sikh pilgrims during their stay in Pakistan. Contingent leader from Delhi Sikh Gurdwara Management Committee (DSGMC) Daligit Singh said that Indian Sikhs and Pakistan’s relations were beyond border restrictions. “Our worship places are well maintained, and that is the reasons that we feel secure among our brothers,” he added. Contingent leader from Bhai Mardana Sikh Parbandhak committee Sardar Santa Singh said Sikhs considered Pakistan their second home and had special religious as well as spiritual attachment. He said Indian Sikh was taking the message of love, peace and friendship back with them. Dr Gasbeer Kaur from Dubai while talking to this reporter appreciated the arrangements made by the Pakistani government. She said that People-to-people contact at all levels between India and Pakistan was essential for peace between the two neighboring countries. Sunti Kaur from the US said Pakistan had rich religious potential and “we want to bring Gora Sikhs”. She said that despite political and military standoff, US Sikhs want to visit Pakistan. She said that the American Sikhs never concerned about security situation in Pakistan as they concerned it land of Guru. Sardar Gulldeap Singh from Amritsar said: “It is my first ever visit to Pakistan and was overwhelmed by the hospitality Pakistani government. Sardar Avtar Singh from UK said he and his fellow pilgrims were impressed by the upkeep of their religious places. He said despite tension between the two countries they would keep visiting Pakistan to pay homage to their Guru. Sardar Sohan Singh, a pilgrim from New Dehli, said that Indian Sikh were thankful to Pakistan government for the maintenance of their religious places and for the security arrangements.